While ABAP programmers do coding of report in ABAP before it runs it needs to be activated and generated. The activation basically means that all syntax checks takes place and active version of the report is stored. Then during generating phase a load version is created. The load version is actually the one which is executed when the report runs. You may have already observed generating phase e.g. in case if you run new t-code which wasn’t run by anyone in the system yet there is a Compiling … message shown in system bar of SAP GUI. This happens usually after upgrades when some part of SAP standard code was overwritten by upgrade. Then ABAP code that was upgraded needs to be re-generated. To speed up this process and prevent users to see this message a job can be scheduled via t-code SGEN. However there are some limits into which the ABAP report can run into during the generation. There are limits with regards to no of global variables, generic global field symbols, Components (of structures etc. ), literals, classes, interfaces, events, methods, local Data and many more. Usually no custom ABAP reports are that big that could reach these limits. However really “large” ABAPs like generated ones e.g. 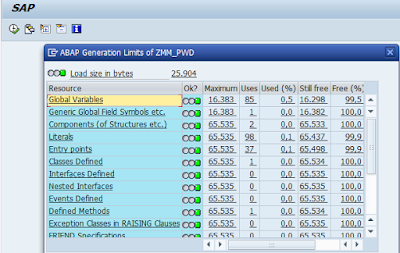 from SAP BW transformations which may have even 10k lines and more these may run into these limits. To evaluate whether some report doesn’t reach into the limits you can use standard ABAP report called BC_ABAP_GEN_LIMITS.